While many aspects of the IoT remain unresolved, if there is one certainty it is that there will be no ‘normal’. Every ‘thing’ in the IoT will likely be designed to accomplish a specific objective. And commercial pressure will demand that it achieves that objective in the most cost effective way possible. Avnet Memec Silica explain. This level of bespoke design, however, does not promote an economy of scale - if every design is unique, it will be necessary for the cost of design and manufacture to come down. One way of achieving this is to use a flexible platform that allows for easy and low cost extensibility. For some time, FPGAs have offered this level of extensibility at the very low level (transistor/gate). The same approach at a higher level can effectively extend the concept and there is now a number of ways of achieving this, such as the Peripheral Modules standard (Pmod) pioneered by Digilent. This flexible interface standard focuses on low frequency, low pin count modules that effectively become ‘peripherals’ to a host device (often an FPGA) which would typically be on a separate board. The specification, which also includes a version that employs the I2C interface, is widely supported by manufacturers and is simple to implement on a host board. Its popularity has resulted in developers having access to a wide range of devices offering new functionality in a format that can be quickly and easily evaluated using a ‘plug and play’ methodology. It’s not surprising that modular design is now seen as being effective in accelerating the development of bespoke solutions targeting the IoT. Who could have accurately predicted the diversity and prolificacy of websites that the world wide web would enable when it was first presented to the public? The number of registered web domains was reported to reach one billion in September 2014, but that number is expected to be dwarfed by the IoT, so it follows that the diversity the IoT will exhibit will be proportionally higher. However, it is widely expected that the first big application area will be the increased deployment of sensors within industrial environments. Using sensors to monitor equipment, processes, resources and productivity offers almost instant benefits - it will rapidly improve industrial automation and positively impact operational costs and the selling price of end products. 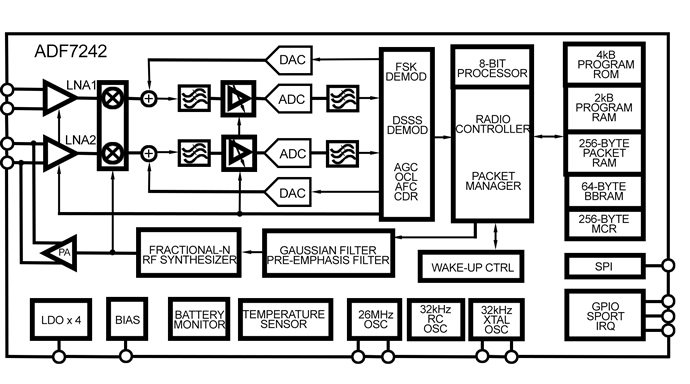 Above: block diagram of Analog Devices ADF7242. The ADF7242 can be used to quickly and easily add wireless connectivity to a system, offering a range of up to 100 metres and a bandwidth of up to 250kbit/s using its on-board antennas. Adding sensors to ‘everything’ requires a local infrastructure as well as the internet, and the way in which this is likely to be achieved is through the use of Wireless Sensor Networks (WSNs). Analog Devices has developed a WSN demonstration platform to enable this - a modularised approach that allows sensors, local processing and wireless connectivity to be quickly connected and configured to evaluate a complete solution. The platform is available in two configurations - the Bunch version comprises two multi-sensor node boards which are based on an ARM Cortex-M3 enabled analogue microcontroller (ADuCRF101), along with an ultra-low power triple axis accelerometer (ADXL362) and a number of additional sensors (humidity and temperature, ambient light, passive infrared) from partners, as well as power management. This is complemented by a gateway node (also based on the ADuCRF101) and an emulator board. The second platform configuration is the cluster version, which includes three multi-sensor nodes. The WSN platform has also been developed to integrate with the IBM Bluemix cloud-based IoT platform - built on open standards, IBM Bluemix is intended to host applications as a service, allowing solutions based on platforms such as ADI’s WSN to more easily deliver useful data. The IBM Bluemix platform communicates with nodes using the lightweight messaging protocol MQTT, developed for small sensors and mobile devices. This protocol can be easily implemented on the sensor side using a low cost Linux-based gateway such as a Raspberry Pi. Analog Devices has worked with IBM to offer a complete solution using the Raspberry Pi to connect its WSN to IBM Bluemix. This move towards a modular solution is increasingly being seen as the ‘right’ way to address the challenge of deploying huge amounts of ‘things’ in a timely and costly fashion. Supporting this approach is the reality that most applications will share the core requirements of a low power analogue enabled microcontroller, the ability to interface to a range of sensors coupled and some form of connectivity. All of these elements can be well addressed by ‘off the shelf’ modules while enabling completely bespoke solutions. The value add offered by these solutions will be less about their configuration and more about the data they deliver, so developers will be looking closely at where they can add that value. If a modular approach to design makes things simpler, adopting a common interface standard makes building and configuring systems even easier. There are many commonly adopted interface standards in the embedded industry and each has been developed to meet the needs of its target market. In the area of rapid prototyping and low volume deployment, the Peripheral Modules standard from Digilent (or ‘Pmod’) offers many benefits. The modules are normally small and low cost, and designed to provide a single but complete function that allows quick and simple extension of a control board, which is often based on a configurable FPGA. Due to its versatility and wide adoption, the Pmod interface has been adopted by a number of integrated device manufacturers, including Analog Devices, which offers a number of modules covering a range of functions. For example, a Pmod module based on Analog Devices’ ADF7242 single chip 2.4GHz RF transceiver (Fig. 1 - page 34) can be used to quickly and easily add wireless connectivity to a system, offering a range of up to 100 metres and a bandwidth of up to 250kbit/s using its on-board antennas. This can easily be complemented by one or more sensors, DAC and/or ADC modules which, when coupled to a host controller can be used to rapidly create an IoT application in a robust format. The range of applications that could be addressed in this format is almost limitless - the small format, low power and cost effectiveness of the Pmod standard offers the ability to address industrial control, medical equipment, HVAC, logistics, warehouse/stock control or any number of other applications where real world conditions need to be monitored, recorded, analysed and communicated. The simple integration of sensor, data conversion and digital control is the domain of the Pmod format. With its focus on low frequency and low I/O pin count, the Pmod specification is an interface perfectly suited to the sensor nodes expected to proliferate the IoT. With a 6- and 12-pin configuration it comprises either two of four power pins and either four or eight signal pins (respectively), which is more than adequate for single-function boards such as signal acquisition and conversion. As the modules are powered directly by the host controller board, typically featuring an FPGA, the number of functions that a system can incorporate is as flexible as the format - the drive current source/sink capability isn’t specified and is instead dependent on the capabilities of the controller - the module can be plugged in directly or connected by cables of up to 18” in length, allowing sensors to be located some distance from the controller. ADI’s ADA4528-2 dual auto-zero amplifier and AD5270-20 programmable rheostat. The use of the programmable rheostat allows for rapid prototyping, as it can accommodate the evaluation of different gas sensors without physically changing any other parts on the board. In another example of how intelligent sensors will help enable the IoT, the CN0332 is a Pmod that uses a magnetoresistive sensor to measure the rotational speed of a geared wheel. The small differential signal from the sensor is first buffered by an op-amp before being amplified and output as a pulsed sine wave. The same format has also been extended to evaluation platforms such as the EVAL-CN0326-PMDZ - a completely isolated low power pH sensor conditioner and digitiser with automatic temperature composition for higher accuracy, featuring the AD7793, AD8603 and ADUM5401 devices from Analog Devices. Building the IoT will require greater engineering effort than anything that has come before - it is literally going to change every aspect of the world we live in. Meeting that challenge will take many more engineering resources than are available, so the only logical solution will be to adopt a modular approach to system design. While there are many formats and specifications available to OEMs, Pmod is arguably the most pertinent to the class of device expected to form a significant part of the IoT - namely sensor nodes. By adopting a versatile FPGA controller board compatible with the Pmod specification, developers will have a wide range of solutions from which to choose, allowing them to rapidly, reliably and cost effectively meet the challenge of building out the IoT. IoT ‘Plug & Play’ solution is "future proof"